eJHS (ISSN: 1611-4426 print and ISSN: 1611-4434 electronic) is one of the peer reviewed journals currently available in the International Society for Horticultural Science publications portfolio. Utilizing industry-standard manuscript submission and review tools such as Editorial Manager and integrating state-of-the-art science publication workflow (XML metadata, full cross-referencing, DOI, implementation of AltMetrics, anti-plagiarism), eJHS is capabale in ensuring rapid review and submission/publication turnaround times. 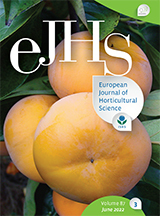 The production of eJHS is overseen by a prestigious and competent Editorial Board selected from the best and most distinguished horticultural scientists belonging to ISHS, the largest and most active international horticultural science society. eJHS provides a strong and fresh alternative to ISHS members and all others wishing to publish their research in a high profile journal with rising impact and a global reach. Using internet technology and ISHS paper submission and handling capacity, eJHS is fully integrated with bibliographic software (e.g. Zotero, Mendely, End-Note, Papers) metadata handling, a recent standard in the scientific publication arena. Visibility and dissemination of research results is further enhanced by the technical capacity to partner with renowned organizations such as AGORA, ORCID, CrossRef, and many others. Most of all, eJHS is streamlined with other ISHS publications and therefore represents an all-inclusive option to meet the publication needs of ISHS members. It seamlessly integrates the most outstanding conference presentations from the many ISHS international symposia and includes comprehensive research outputs. We warmly invite your submissions. eJHS is published in print + online Open Access. //For editorial inquiries: write to the Editor-in-Chief. //By submitting your article to eJHS you agree to cover the article publishing charge (APC) immediately upon acceptance of your paper (see details below).